The law governing the rights of residential landlords and tenants in Florida is largely governed by Chapter 83, Florida Statutes. Commercial leases are also covered in Chapter 83, but the typical commercial lease is far more extensive, and many aspects of the tenancy are determined by the terms of the lease contract. Leases longer than one year in duration must be in writing and witnessed. Shorter leases do not have to be in writing. An oral lease that requires monthly payments is called a month to month lease. A month to month lease can be terminated by either the landlord or tenant by giving at least 15 days written notice before the end of any month. The typical residential lease requires the payment up front of a security deposit, and first and last month’s rent. The landlord has statutory obligations to maintain the premises suitable for habitation. Maintenance of the rental is negotiable and should be spelled out in the lease. Claims on security deposits at the end of a lease are frequently an issue between landlords and tenants. A landlord must timely make a claim on the deposit, and the tenant must timely object. If the landlord and tenant cannot workout their differences, then a court must decide the dispute. These claims are tedious and expensive if a lawyer gets involved. If possible, it is best to resolve such claims outside the legal system. The other obvious area of dispute involves nonpayment of rent. Again, Chapter 83 defines the rights of the parties to a lease when there is an issue over payment. If a tenant is late in the payment of rent on a residential lease, then the landlord must serve the tenant with a three day letter to pay the rent or vacate the premises. If the tenant does neither, the landlord must then file suit to evict the tenant. Eviction proceedings are put on a fast track called summary procedure. Unless there are other issues, an eviction for nonpayment of rent usually takes about four to six weeks to complete. 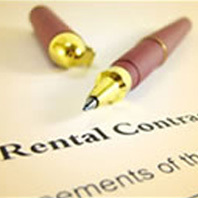 During the proceedings, the tenant must pay the rent as it comes due into the court registry. If the tenant fails to due so, then a default judgment will be entered against the tenant. The lawyers at Scott, Harris have many years of experience in landlord-tenant law, from drafting complex commercial leases to suing for eviction and damages in both residential and commercial properties. There are technical, legal issues in landlord-tenant law that can seriously affect the rights of a party to a lease agreement, and it is best to have legal representation either when entering into a lease, or when a dispute arises in an existing lease.